The venue of the Lake Zurich Set Dance Weekend 2018 simply remains spectacular. It’s hard to beat its location directly on the lake, surrounded by hills, with mountains in the distance. When one looks out over the lake there is the sense of being part of a larger whole, at one with the world around us. This, of course, was enhanced by the participants who came from all over Europe to join in on the fun: Ireland, France, Italy, Germany, Czechia, and Great Britain. Perhaps it was a result of this that I did an impromptu and statistically unreliable survey of how the Irish participants experienced this workshop. For them, it had the aura of exoticism, being something quite special to play and dance their own music in such a dramatic setting. And although our appreciation may not be expressed with as much exuberance as in Ireland, they sensed a respect for both the dance and the music that they do not always encounter on the home front, where the element of social entertainment has made itself only too well known. In particular, the musicians commented on how the dancers responded to the music, allowed themselves to be stimulated by it, rather than taking control over it, leaving them much more freedom in their playing. 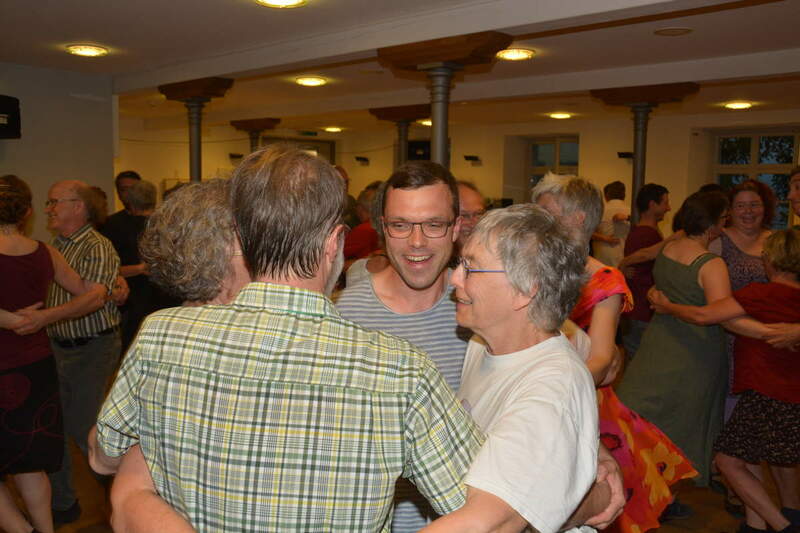 It is just the flip side of our pleasure in going to Ireland to dance, where we love the enthusiasm and warmth of the ceilis, the sense of being able to enter into another tradition. And as one of the musicians said, in the end everybody is smiling and sweating, no matter where they are. The workshops were led by Pádraig and Róisin McEneany, who once again spoiled us with the excellence of their teaching. The simplicity with which the sets are broken down to their individual elements, only to be reconstituted as a whole is breath-taking, and makes for easy consumption. In addition, the manner in which Pádraig introduces battering steps is so encouraging, that he makes it possible for all of us to partake in them to some degree. The four sets chosen for our attention were the Knockanore, the Termonfeckin Lancers, the South Sligo Lancers and the South Kerry, which were all also danced at the ceilis. And the ceilis were a real treat, as the dancers were spurred in their gyrations by two different bands. 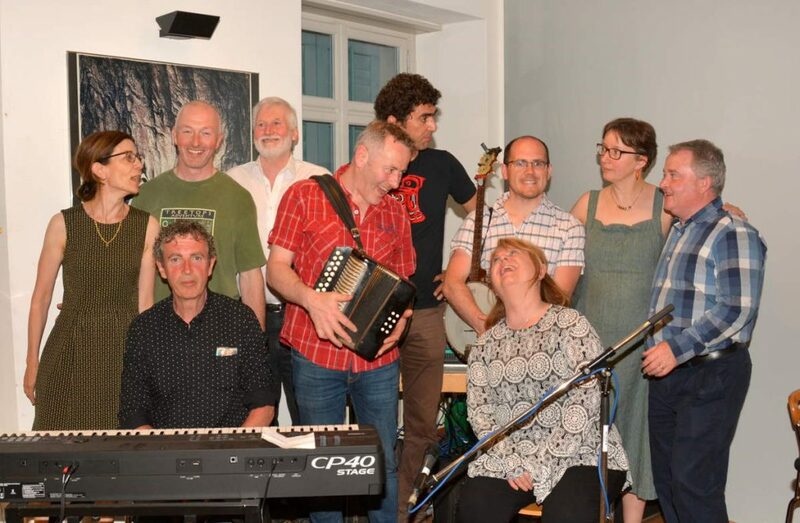 As in the previous year, the first two were played by Tom Doherty on the accordion, Brian Scahill on the banjo, and Jim Corry on the piano; the pianist was then joined by Mark Donnellan on the violin and Charlie Harris on the accordion for the last two ceilis. The bands tickled our toes and our fancies, with their drive, their lilt, the occasionally rhythmic jabs from the banjo and swoops from the violin. A real pleasure. Eva Biedermann, Manuela Morel and André Lichtsteiner exhibited their excellent organizational skills once more, ably backed by dancers from the Zurich group, Bundle of Fun. Now we are just left with the bittersweet pleasure of anticipation: the next one will be taking place from 7-10 June 2019.